Thousands have gathered to kick off the 33rd Annual Okinawan Festival at Kapiolani Park on Saturday. Presented by the Hawaii United Okinawa Association, the festival will bring a weekend full of ono food, entertainment, cultural exhibits, and even performers from Okinawa. During the weekend-long event, featured performers include Radio Okinawa's Miuta Taisho Grand Prix Winner, Ritsuko Shibahiki, and Okinawa Yui Buyo with their contemporary Okinawan line dances. Among the cultural tents are the Hawaii Bonsai Association, Okinawan Genealogical Society, Japanese Cultural Center of Hawaii, and the UH Manoa Center of Okinawan Studies. There will be displays and activities involving calligraphy and Okinawan language (uchinaaguchi), and kimono and paranku picture taking. And for the food lovers, there will be many food booths featuring some favorite Okinawan dishes: Andagi, Andadog, Okidog, Yakisoba, Maki sushi, and Okinawan Soba. The Okinawan Festival Shuttle Bus from Kapiolani Community College will run continuously during the Festival. Three dollar return tickets can be purchased at the Information Booth and Shuttle Stop Booth at Kapiolani Park. The last shuttle will depart from Kapiolani Park at 10:30p.m. On Saturday and at 6:00p.m. on Sunday. 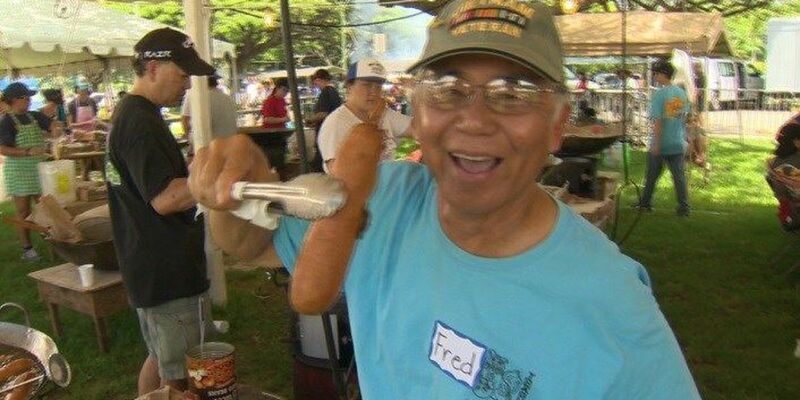 The festival is organized and run by an army of over two thousand volunteers from the Hawaii United Okinawa Association. Proceeds are used to fund the cultural programs. The first Okinawan Festival was held in 1982 at McCoy Pavilion at Ala Moana Park.